The horrific photo of Aylan: News organizations that chose not to run it were wrong. A Turkish policeman stands near the body of Aylan Kurdi, who drowned in a failed attempt to sail to the Greek island of Kos, September 2, 2015. Earlier this week, a dozen Syrian refugees drowned off the coast of Turkey while attempting to flee to Greece. Among the dead was young Aylan Kurdi, who became the subject of a series of harrowing news photographs that illustrated the sad and monstrous toll that the Syrian conflict has taken. I can accept Swansburg’s logic—Keating’s article and mine are two very different pieces, after all—but I also think that if you’re an editor who has the opportunity to run a heartbreaking and newsworthy photograph, you should probably run that photograph instead of some other, lesser photograph. But running the photograph alone isn’t enough. Publishing a graphic image of a dead child without also giving your readers the tools they need to follow and understand the broader story might be worse than not publishing it at all. 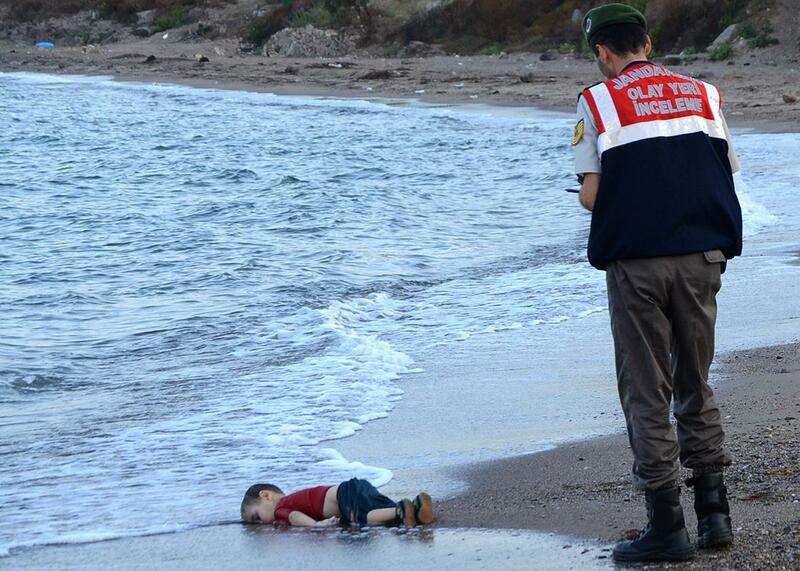 The drowned-boy image is sad, and depressing, but it’s only shocking if you don’t understand where it comes from. During the past several years of warfare and flight, more than 200,000 Syrians have died, and many have died horrible deaths. They’ve died in bombings. They’ve died in chemical weapons attacks. They’ve died attempting to flee their country, and their bodies have been found in trucks, in the snow, and on beaches. You have seen images of almost none of them. That’s a mistake. Slate and Swansburg are not alone in this circumspection. As the New York Times wrote in a story about how newsrooms dealt with the decision whether to publish the picture, “many editors were concerned about shocking their readers and wanted to avoid the appearance of trafficking in sensational images for profit.” And yet readers know what death looks like, as well as pain, sickness, and desperation. They know these things because they are adults. And all adults know that the world can be a cruel place, and that horrific things happen every minute of every day. You are not like the wealthy dowager in a Marx Brothers movie, ready to faint at any unpleasant shock to the system. Why, then, do so many in the media persist in pretending otherwise? Unpleasant things are shocking when they appear suddenly, without warning, context, or explanation—and this point gets at the line about “trafficking in sensational images for profit.” There is a qualitative difference between publishing explicit images in order to titillate—as some tabloids do so well—and doing so in order to illustrate some broader point. And the point illustrated by the photograph of a dead toddler—the most devastating one available—is that the situation in Syria is a horror show, and that, as a human being, you ought to know about it. The image is resonant and journalistically relevant because it illustrates the human toll of an ongoing humanitarian crisis that persists, in part, because the world pays it very little attention. Speaking to the New York Times, the foreign editor of Vox justified his decision not to run the photograph by speculating that its virality was “less about compassion than voyeurism.” But journalism is inherently voyeuristic. Journalism is the act of uncovering stories that would otherwise remain private and showing them to the world. The best journalism combines compassion and voyeurism. It exposes hidden truths and then convinces people to face them. The media’s tendency to sanitize and censor unpleasant images can serve to camouflage—and to an extent sanction—the unpleasant acts and policies that produce them.